There is, on La Gonave’s far western parts, a tiny village. They call it Pikamabe. Don’t know if it’s spelled right but that’s how it sounds. Peek-a-maybe. A man from Pikamabe showed up at the Starfysh house a few weeks ago to ask if we could give them some water filters–they had had several cases of cholera in their village. It happened that Freddy, our Teams Coordinator, had just arrived on the island to work for a week, bringing with him four Michiganders. It took our team four hours to get to Pikamabe from Anse-a-Galets, where our house is located. It wouldn’t take that long on 4-wheeler ATV’s or on motorcycles, but in the truck we have to go so much slower because we can’t dodge the gigantic rocks and crevices like we can on the small vehicles. They journey was 32 miles each way, a lot of which was winding roads and turns. Nevertheless… 32 miles, four hours. They told our group that no outsiders had ever come to their village. No doubt! Not on any map, Pikamabe is in the middle of nowhere. But there it was. And there they were, these precious people whom, I am sure, God has always known. 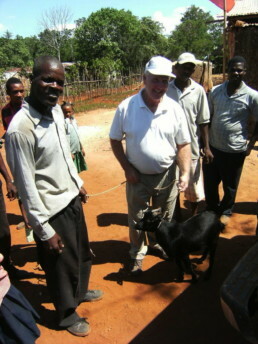 After the filters were installed and the village served our crew up a meal of goat, rice and beans, the village then presented us with a goat, in appreciation for our visit. I’m not just sure what they appreciated more: the filters or the fact that we came. I think it was mainly just because we came. There’s just something about sheer presence. Showing up. Letting them know that someone knows who and where they are, and that they are not alone on this planet. I figure we’ll be back. La Gonave: 37 miles long x 9 miles wide. Home to more than 100,000 people.